Murals — those large-scale visual feasts for passers-by — are lively lessons in the socio-political-cultural dimensions of a city. Tucson is a thick repository of public arts, and street installations by artist Mel “Melo” Dominguez are an example of our community’s expansive story walls. Dominguez, an artist and muralist formerly involved in East Los Angeles community youth engagement, has painted cultural statements in Tucson since 2007. Her works represent intricate stories that express her Chicano/a culture as well as her community stewardship. “Public art murals transcend all languages and mark a time and message to be remembered,” says Dominguez. She believes murals build bridges of communication between a community and its visitors. Much of Dominguez’s art depicts the calacas (skeleton) and dia de los muertos, “…because I like to reflect death as a celebration into the afterlife,” she says. “There are also many scenes in my art where I incorporate these images to talk about the politics that surround our border and the deaths of migrants in our desert,” she continues. Murals, in speaking of the past, present and future, can be political statements made grand through the street art format, Dominguez believes. They engage viewers in ways not restricted to a gallery setting, becoming part of lives. “Murals are written thoughts, out in the open, a public story-telling,” she explains. 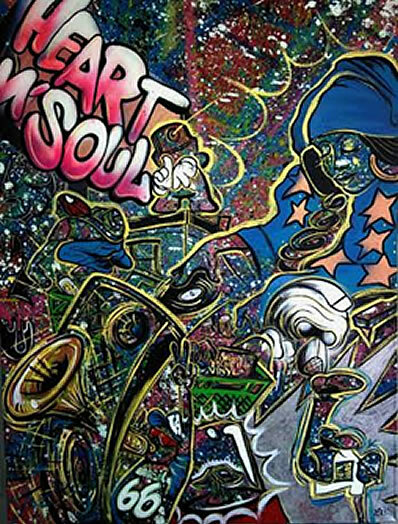 In discussing graffiti art, born out of the street, claiming name and barrio, Dominguez believes some aspects have changed over the past 10 years. Graffiti artists are now creating aerosol art murals that move away from tagging, and delve more into visual narratives. In recent travels to Uruguay, Dominguez saw the politics of street art and graffiti as a powerful challenge to traditional notions of showcasing art. She saw this inner city’s expression of non-conformism and social commentary as vivid, physically intensive art that inspires conversation. 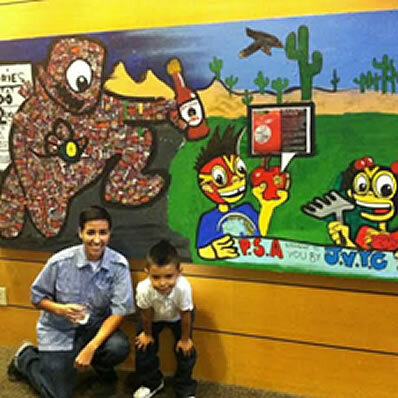 Dominguez’s PSA mural panels created with South Tucson youth at the John Valenzuela Youth Center also accent community activism in public spaces. “These panels tell stories about anti-graffiti/pro art, junk food monsters/learning about healthy food, and food codes,” she notes. Dominguez was commissioned by Pima County Public Library’s “Nuestra Raices” to paint the backdrop of the stage at the Tucson Festival of Books. Recent panels reflected cultural storytelling in visual public art: “One panel illustrated how Mayans used art to communicate and share information, such as history, time, farming, and rituals. Another was about the ritual of farming the land and how those rituals are passed down through generations, with ‘Maiz,’ the main crop, representing abundance. Stories of everyday life prevalent in Mariachi music were another panel,” she explains. Mariachis as part of a family’s cultural milestones is a significant theme to Dominguez, whose grandfather and family were part of one of the first mariachi groups to play on the streets of downtown Los Angeles in the 1930s. Muralists provide a pivotal contribution to Tucson’s street art “canon.” They invite viewers to think about the many layers of political, ideological, spiritual and gender meaning latent in images found in our city’s free, open-air galleries.